Yajuz in 1998. 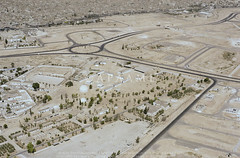 © APAAME_19980517_DLK-0031. 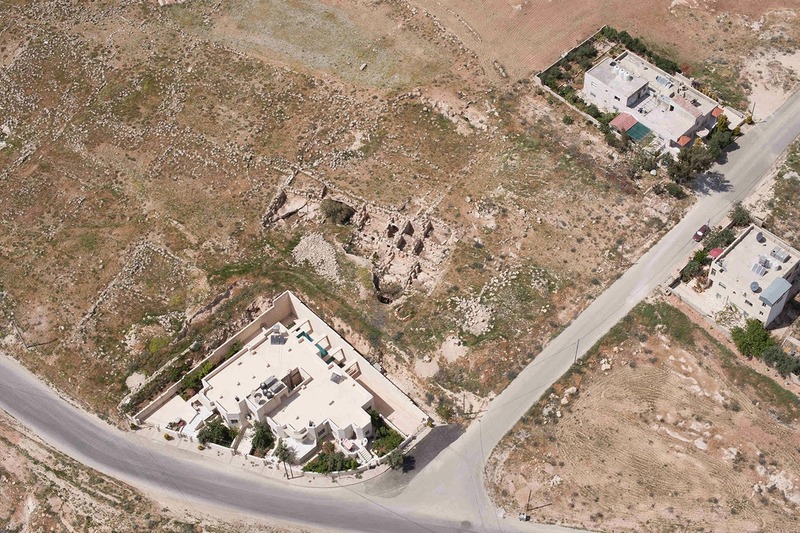 Yajuz is a small town of the Roman period lying about 10 km (sld) from the centre of Roman Philadelphia (Amman). Excavation has revealed three churches with mosaic pavements, several major residential buildings, an area with major wine presses and a large tomb nearby. The full extent is unclear but is probably 15-20 hectares. A major settlement in the hinterland of Philadelphia, probably one of several but unusual in that it has not been overlain by the expansion of Amman. 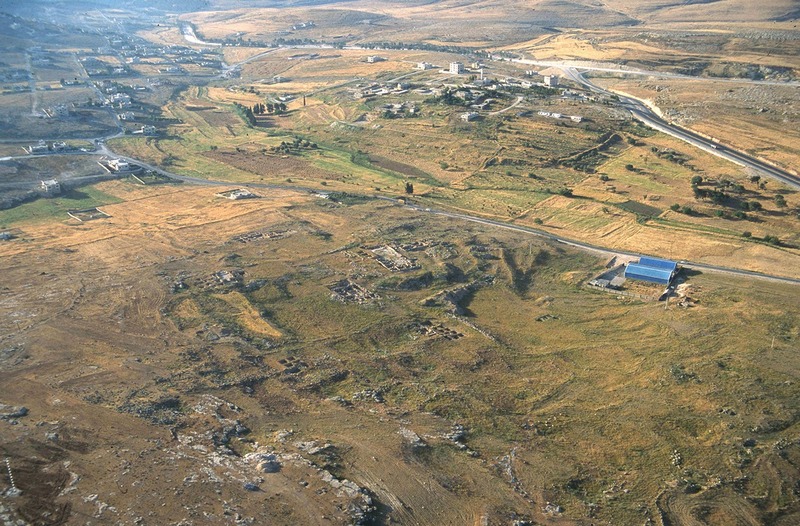 The Roman highway from Philadelphia to Gerasa (Jarash) passes by its eastern fringe (Blue). The road has been well-known for over a century and numerous milestones have been recorded. 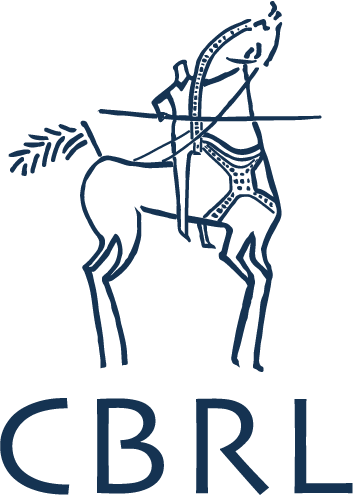 The first stage of about 10 Roman miles is now hard to trace amongst the rapid recent sprawl of Amman and many of the milestones have been broken up, buried or pushed away by development. 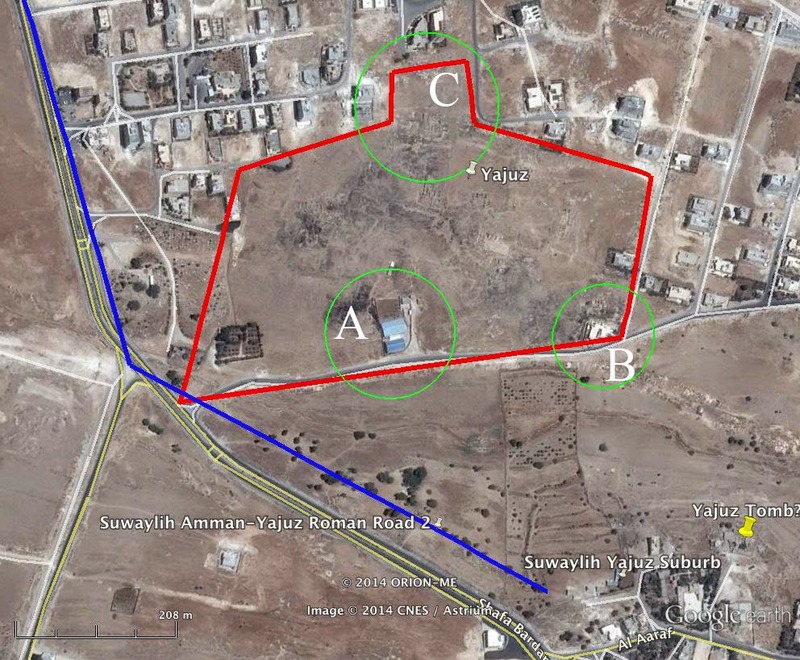 Yajuz itself seemed safe, protected by its status as a site excavated extensively over many years and marked by boards set up by the Department of Antiquities of Jordan. Google Earth screen capture of Yajuz site with areas of interest indicated. In the last decade that status has come under threat as massive new housing projects have sprung up all around, major highways have sliced past making it an attractive commuter suburb and the price of land has continued to soar. 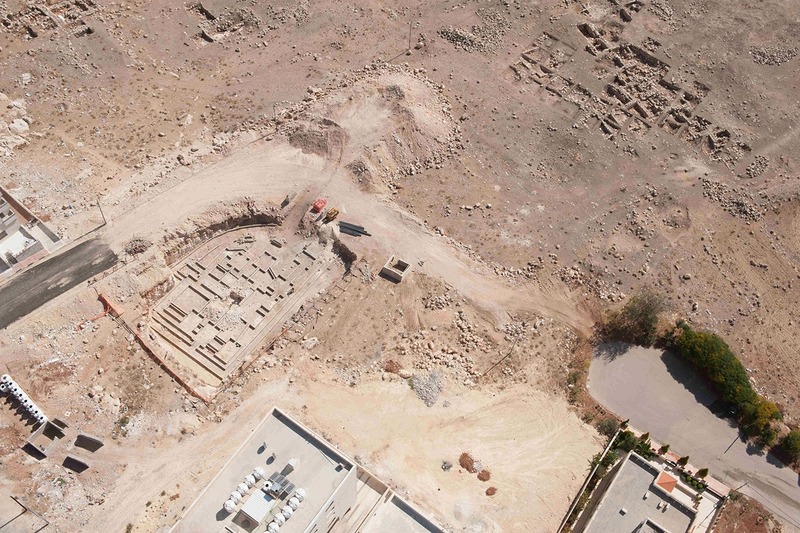 APAAME’s flying programme – Aerial Archaeology in Jordan, has regularly monitored the site, a task made easier by its proximity to a regular route for us returning to the airfield at Marka. In 2010 we singled the site out as a place that deserved special protection and development as a tourist destination (Kennedy and Bewley 2010: 199-201). New Apartment blocks at 'A'. © APAAME_20141029_DLK-0503. Houses at SE corner of Yajuz at 'B'. © APAAME_20130414_RHB-0468. It is clear the site is being slowly but steadily eaten away by development. The blue-roofed building which had already intruded into the site over a decade ago has now – since April 2013, been joined by a two large blocks of apartments (A). At the southeast corner two houses were cut into the site several years ago (B). Now another house is being constructed cutting into the north edge (C). House in North of site at 'C'. © APAAME_20141029_DLK-0512. Unless steps are taken immediately, Yajuz will join the catalogue of other small towns around Philadelphia, still notable ruins in the 19th and early 20th century which are now largely lost. 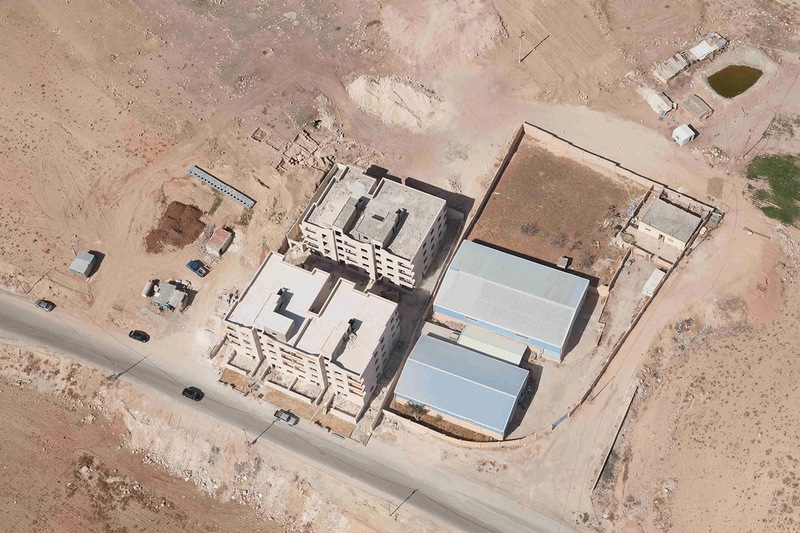 Kennedy & Bewley (2010) 'Archives and Aerial Imagery in Jordan', in Cowley, Standring and Abicht (Eds) Landscapes through the Lens, Oxford: 193-206.